Access your assignment submission link. Select Mashups > Kaltura Media from the text editor. Optionally, upload the video or audio file to My Media if you have not done this previously. Click the Add New button and select Media Upload from the drop-down menu. Click on the Choose a file to upload button. Select and open the required file(s). Click on Select button to choose a file to submit from the list. The video or audio file will be embedded in the text-editor. Click on the Submit button to submit your video or audio assignment. Select My Media from the Tools section. Click on the Add New button and select Media Upload from the drop-down menu. Enter a video or audio name in the Name textbox. Enter your course code and any tags specified by your instructor in the Tags textbox. Enter a short description as specified in the assignment instructions in the Description textbox. Click on the Back to Browse and Embed link. Click on the title or thumbnail of the video you just uploaded. Click on the the Actions button below the media player. Select Publish from the drop-down list. 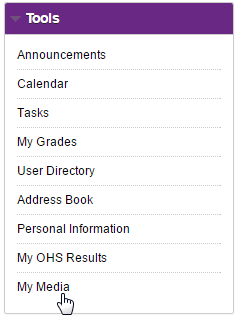 Check the checkbox next to your course from the list. The video or audio will be published to the Course Gallery (pending means it is only visible to your course coordinator via the Course Gallery). Note: For videos or audio that are not to be shared with the rest of the students enrolled in the course, the status will remain as pending and the video or audio will only be visible to you and your course coordinator. Select Add New > Webcam Recording. The webcam will launch in a new window. Click anywhere on the screen to start a recording. Click anywhere on the screen to stop a recording. Click on the Save button to save your recording. Alternatively, click on the Record button to discard the recording and start again. Enter a video name in the Name textbox. Add a short description of the video in the Description textbox – refer to assignment instructions. Enter your course code in the Tags textbox - or as specified by your instructor. Once the file has uploaded, click on the Save button. Click on the Back to Browse and Embed button. Click on the Select button for the webcam recording you want to submit. The video will be embedded in the text-editor. The below table gives an indication on approximate upload times for a variety of connection speeds and file sizes. Note: The above mentioned upload times are theoretical and are to be used as a guide only. Other factors can influence the upload speeds. Recommendation: We recommend that both staff and students should upload videos to Kaltura while they are on Campus and connected to either eduroam or using a UQ computer. This will reduce the time it takes to complete the video upload.